How Do You Dye Gray Hair Black with Henna and Indigo? 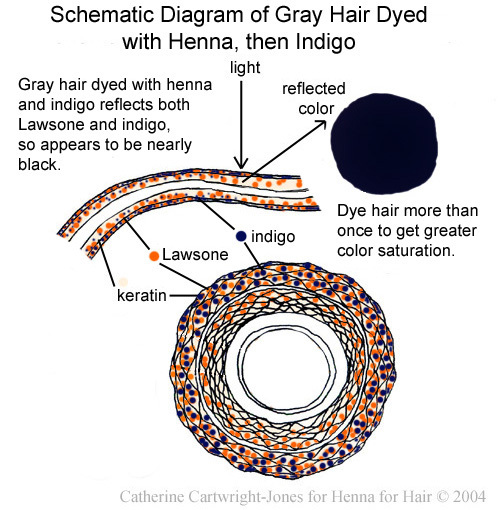 Dyeing gray hair black is challenging and the holy grail of henna and indigo! Why? Black chemical para-phenylenediamine dye is extremely hazardous to your health. It is linked to asthma, non-Hodgkins lymphoma, lupus, and bladder cancer, as well as causing hair loss and horrific allergic reactions. Not only that, but the plants you can use to dye your hair black are GOOD for soil, and give farmers in marginal areas a cash crop when all their other crops fail. Learn to use henna and indigo to dye your hair black, save your health, and save farmland! Here's how you can get absolutely beautiful raven wing black with henna and indigo. When you dye gray hair with henna, the Lawsone molecules will penetrate the keratin in the hair shaft and dye it orange. If you dye your hair with indigo immediately afterward, the indigo molecules will penetrate the keratin in the outer layers of the hair shaft with indigol molecules which will oxidize to dark blue. Powdered indigo leaves prepared for hair will react with the acidic henna to blacken the orange. Your hair will be dyed black as the result of this interaction. In Turkey, white woolen yarn was dyed rich, long-lasting black by dying it once with henna, and overdying that with indigo. Your hair is made of keratin, just as is wool. If you use pure body art quality henna that has been tested at an independent laboratory and certified to have lawsone at 2.3% or above, and leave the paste in your hair for several hours, the keratin hair shaft will become saturated with dye. If you use high quality indigo immediately after body art quality, laboratory certified high dye content henna, you have the best chance of dying your gray hair a deep, natural-looking black color. If the indigo has been lab tested and proven to be a neutral PH, your hair will be sleek, shiny, healthy and perfectly black! You can get these from Mehandi. After you complete the dye process, it will take two days for the dyes to naturally darken to peak color. If you do not get satisfactory color saturation the first time, repeat the dye process until you build up the color you want. Henna is beneficial for your hair, you can dye as often as you like! However, once you've gotten your perfect color, you probably only need to keep up the roots. The indigo molecules are slightly larger than Lawsone molecules, so they stain the outer layers of the hair shaft. Some people find the indigo color fades slightly over several weeks, and the henna begins to show through. You can refresh the color by dying your hair with a mix of mostly indigo, and a little henna. If you dye your gray hair with indigo, without the henna, you're apt to be a "blue haired old lady". If you're a lady. If you're old.